It's all about the message. That was the overall attitude of the 2017 EMA Awards, which took place on September 23rd at Barker Hangar in Santa Monica. Our goal was to let the world know that we have the solutions to save our planet, and we refuse to have our voices drowned out by those bent on destroying our planet for profit. Mission accomplished. 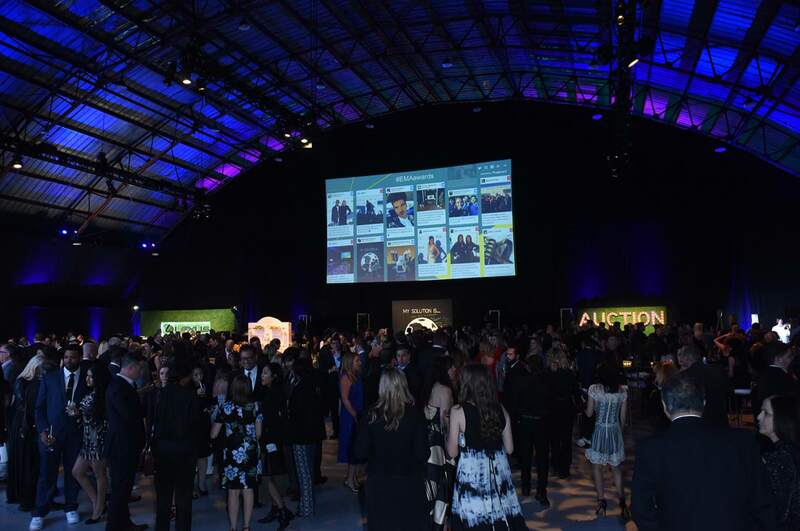 With over 48 million reach and 100K interactions in just 24 hours, our #EMAawards brought green messaging focused on solutions to a vast audience. Social messages using our hashtag (which trended on Twitter in LA) from all over the world were showcased in real time on our giant social media screen during our pre-reception. Further, we kept the messaging going post-show with social media campaigns that included three viral videos that received a combined 10 MILLION views on Facebook and Youtube! Opening the show, veteran EMA Board Member, Ed Begley Jr. “surprised” EMA’s millennial Host and infectiously passionate Board Member, Jaden Smith by attempting to pick him up with his iconic bicycle. Jaden graciously invited Ed to drive in his hydrogen fuel cell Toyota Mirai for a more comfortable (sustainable) trip to the gala with Jaden bounding onstage, kicking off the evening with his authentic positive energy. 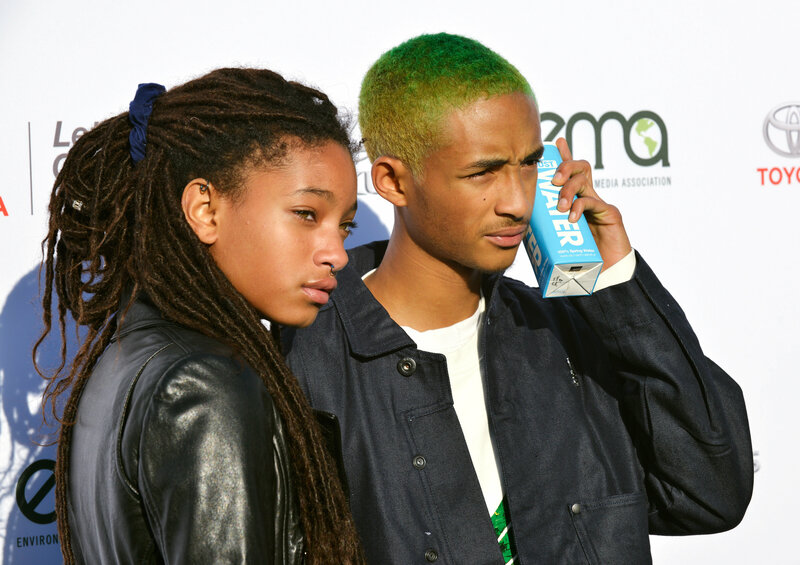 Sporting green hair to honor our mission, Jaden made it clear that he's more committed than ever. "The lowering of CO2 emissions and plastic in the world is the main priority in my life." Similar to his moving speech at last year's Awards, Jaden let the audience know that this is just the beginning of his journey and vowed to continue his mission to protect the environment utilizing his creativity and drive and very eloquent voice. As always, we are so inspired by Jaden and grateful to have him on our Board. And to the surprise of no one, Jaden makes an incredible Host! 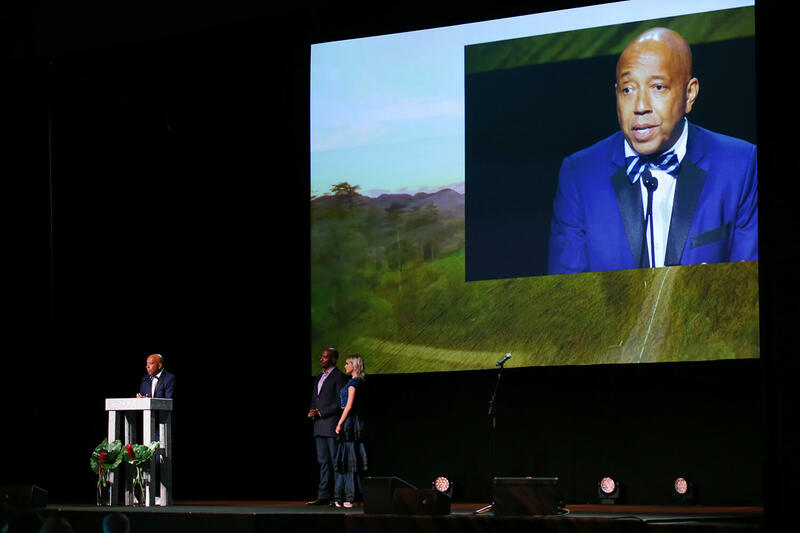 Honorees Natalie Portman and Russell Simmons focused on the environmental impact of individual actions, focusing in on agriculture and the link between climate change and a plant-based diet. Both speakers elucidated why they chose to eat a vegan diet and challenged the audience and those watching on social media to reduce the amount of meat they eat. Natalie stated, "So we get to make decisions three times a day, what we do with our planet, and you can make a difference by even once a day or once a week choosing not to eat animals or animal products.” The Oscar Winning Actress also discussed her upcoming documentary 'Eating Animals', which examines the harm eating animals has on our planet and our health. After a heartfelt intro from Board Member Van Jones, Honoree Russell Simmons took the stage. Russell explained the connection between factory farming and environmental issues. Further, he presented humanity's animal-based diet as a karmic issue based on "unconscious behavior." 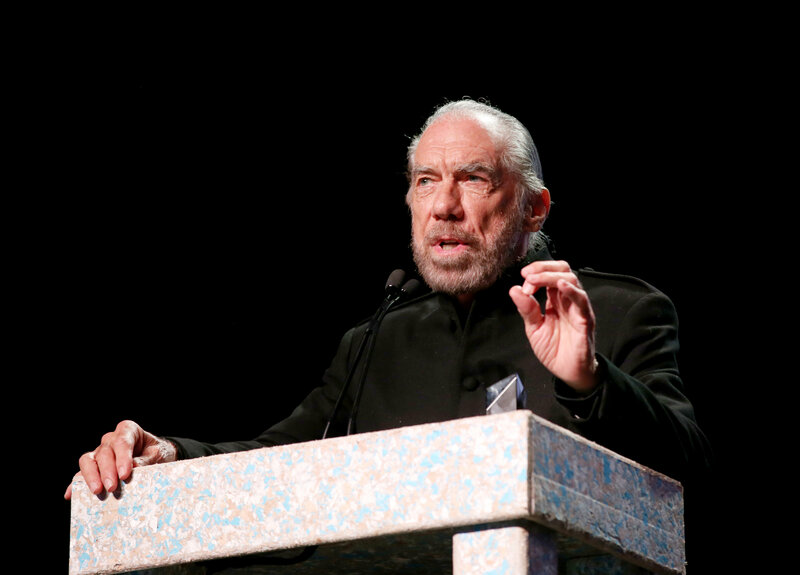 The music industry legend ended his speech with a simple yet profound plea: “I challenge you all to eat a plant-based diet." We can't wait to host our 2018 IMPACT Summit on May 21 & 22 at the elegant and eco-friendly Montage of Beverly Hills. We'd like to thank our incredible Host and Board Member Jaden Smith for inspiring us with his tireless passion for doing better for our planet. There's a lot of uncertainty regarding the environment, but it gives us hope to know the next generation of environmentalists have a ceaselessly creative and dedicated leader in Jaden. 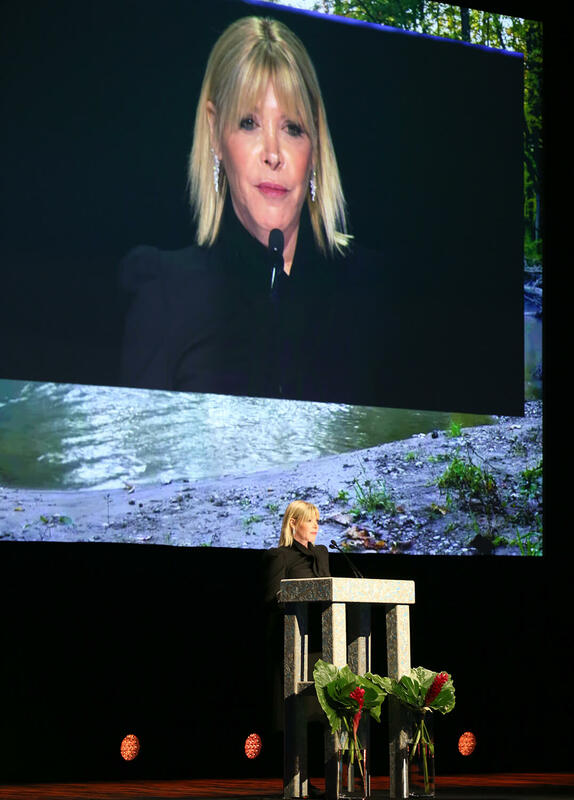 And to our remarkable Honorees, nominees, presenters and Board Members: Your work to save our planet is a constant inspiration to all of us at EMA. You all realize the tremendous importance of messaging and have made the most of your platforms and influence to spread solutions. We know none of you will be satisfied until humanity lives harmoniously with our planet, and we look forward to the work that is ahead of you. Our Presenting Sponsors Toyota and Lexus, We thank you for 17 years and counting of our extraordinary partnership. We are forever inspired by your dedication to create a sustainable future. 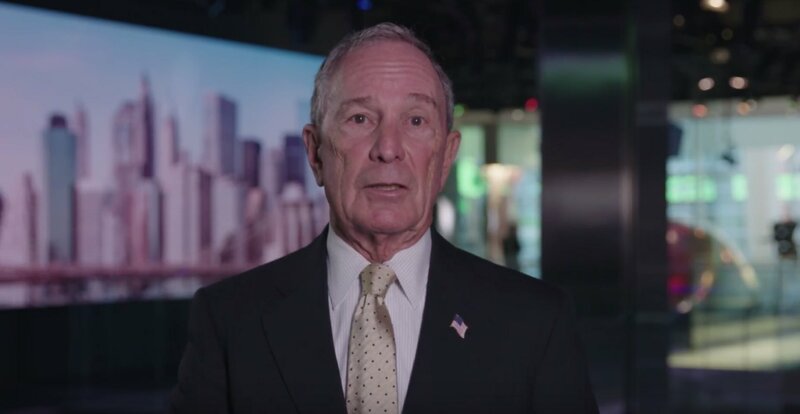 As Jaden put it during the show, "I love the way they use their cutting-edge Hydrogen fuel cell vehicle to reduce carbon emissions, which is why they were once again named to Fortune Magazine’s Change the World List. For all they do, including their eco-billboard initiative that’s helping Californians breathe a little easier, we plan to keep riding in style with Toyota." 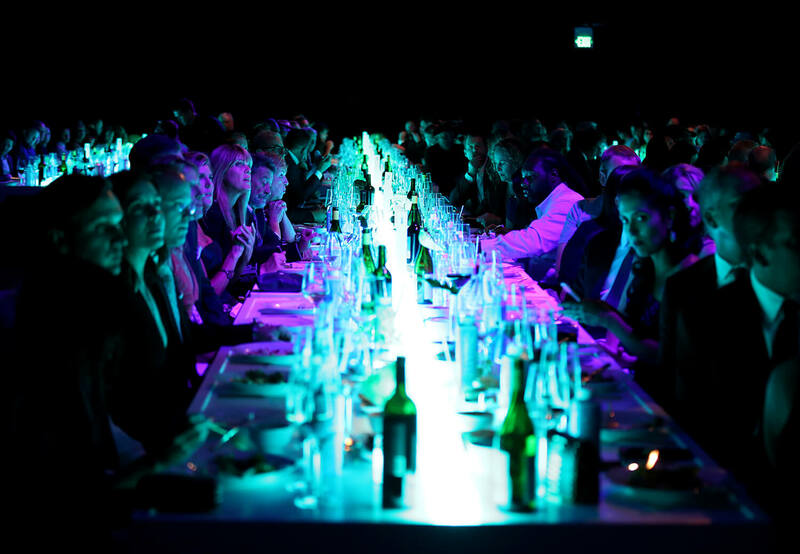 Thank you to our outstanding teams at RGLive Events and SenovvA for helping us create a memorable evening. And to our chef Akasha Richmond and her incredible team for preparing such a delicious organic and locally-sourced vegetarian and vegan dinner. Finally, our most sincere gratitude to our amazing partners: Biossance, Bloomberg Philanthropies, Bona, Calvert, Clover Sonoma, Earth Friendly Products, John Paul Mitchell Systems, JUST Water, Kellogg Garden Products, LAcarGUY Family of Dealerships, Montage International, Participant Media, Patron Tequila, Rush Philanthropic Arts Foundation, Star Waggons, Tetra Pak, Variety. 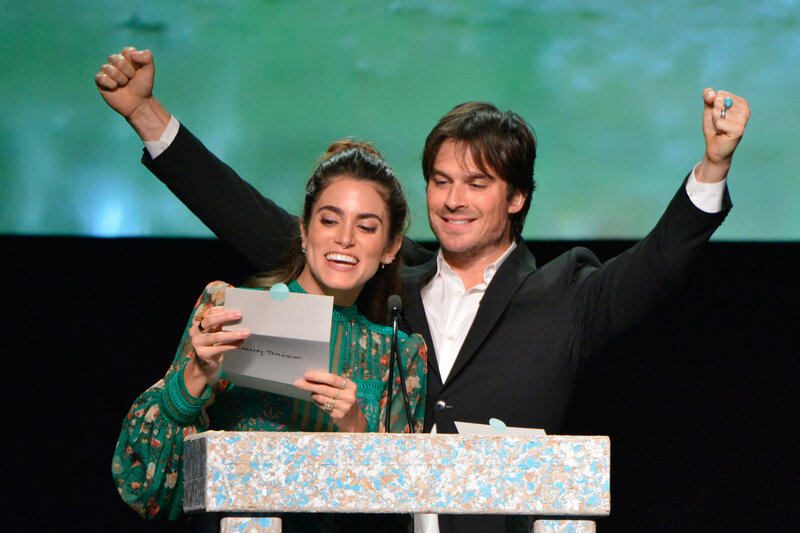 The EMA Awards is an annual reminder that you have the power to make a difference. From your power as a consumer to your influence as a celebrity, student, parent, activist, or whatever your role, your decisions have an impact on our planet. 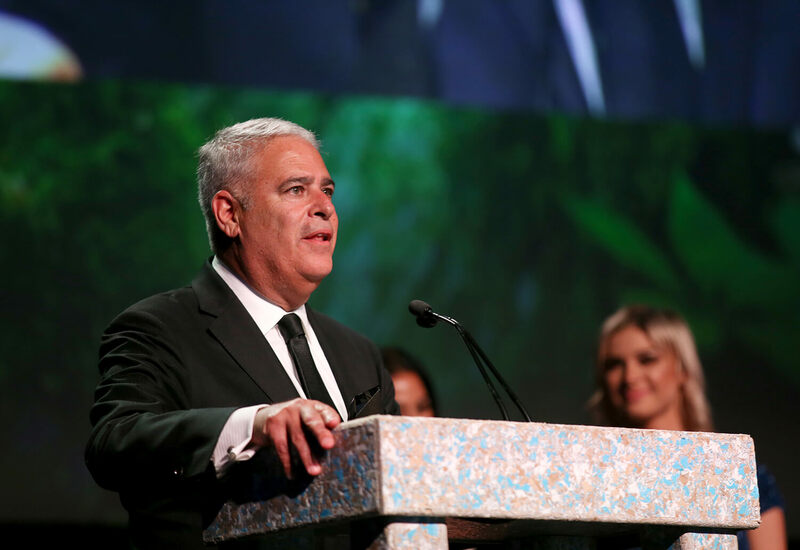 We are proud that the EMA Awards gives a platform to so many dedicated environmentalists. Sadly, none of this matters if we don't take action. We must keep this messaging consistent and loud throughout the year, and all commit to being more responsible stewards of this planet we call home. Help EMA Be Louder Than the Deniers! As the fossil fuel industry pools its money behind a unified voice that peddles denial and misleading information, the environmental community continues to lag behind. What EMA provides is THE voice for our planet and a very loud one at that. Our tremendous reach at this year's Awards is just a glimpse of EMA's potential to be the loudest voice in the room, but we need your help! As the Koch Brothers funnel tens of millions of dollars into organizations and think-tanks that spread denial, we have to be smarter, sexier, and more compelling. EMA is the only unified environmental voice that can be louder than the fossil fuel and big chemical companies. From the business world to the entertainment community to families and individuals, EMA continues to be the collective loudspeaker for what's working. Help us be louder than ever before by donating today. All proceeds go towards expanding our many programs, including messaging campaigns to counter the lies with the truth about our urgent environmental issues, which we CAN prevent with global action. 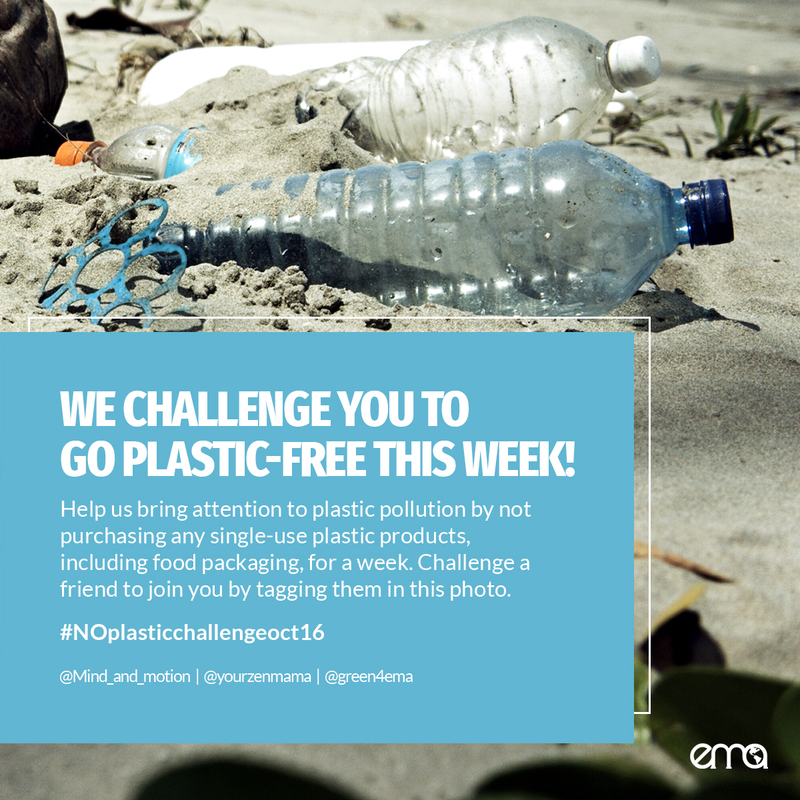 EMA Fights Plastic Pollution With Week-Long Challenge! In the second week of October, EMA joined forces with Your Zen Mama, Mind & Motion, and EMA Board Member Sarah Wright Olsen to create a plastic-free challenge. We know a week-long challenge won't solve the world's plastic crisis, but our goal was to change some mindsets. By avoiding single-use plastics for a week, you realize just how much plastic you encounter in your life. A comment on a recent Instagram post asked, "why is plastic so bad if we recycle it?" There are two issues here. First, plastic just doesn't get recycled. According to National Geographic, only 9% of plastic is recycled. Just think about it, humans have made billions of tons of plastic and, on a good day, less than 10% gets recycled. Where does it all go? Landfills, our oceans, and waterways littering our streets and sidewalks. Secondly, traditional plastic is made from fossil fuels and designed to last forever. Since they make plastic from nasty stuff, it can potentially harm our health, our soil, and wildlife. 1. Use reusable grocery bags and produce bags. 2. Either take your own mug or opt for a ceramic cup when you visit your favorite coffee shop. 3. If you must order takeout, ask for no plastic utensils or bag (remember to bring your reusable bag when you pick up the food). 4. Say no to straws when you dine out. We learned a lot from our challenge, and we hope to have inspired many others to reduce the number of single-use plastics they use.